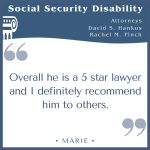 Mr. Hankus is a very good disability lawyer, and he helped me get my SSD quick and easy. I recommend him to anyone who is looking for a good lawyer. I had originally applied and I was denied. And I contacted Mr. Hankus, he reapplied for me, and won my case. 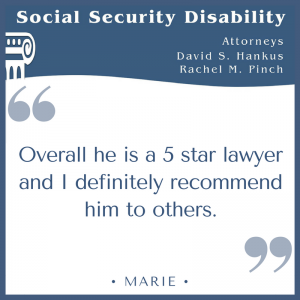 Overall he is a 5 star lawyer and I definitely recommend him to others.